The club is still looking for members, coach says. This college’s boxing team first met March 19 and began daily workouts March 20. 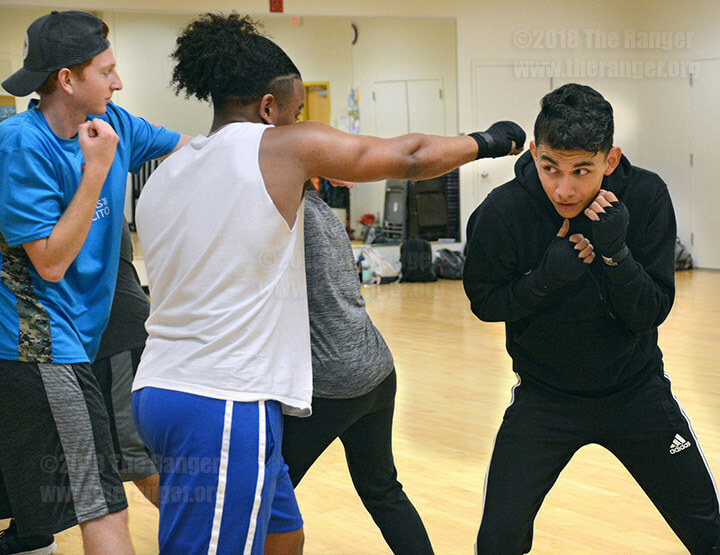 Boxing coach Hector Ramos said workouts will be 4-6 p.m. Monday-Friday on the second floor of Loftin Student Center or inside Gym 1, Gym 2 or the dance studio of Candler Physical Education Center depending on the team’s daily needs. “A lot of people are scared about the first day of boxing because they think they are going to get punched in the face,” coach Hector Ramos said in an interview after the meeting. About 30 students were at the meeting. During the meeting, Ramos encouraged club members to invite friends and classmates who may be interested in joining. Ramos said the goal of the meeting was to show potential members what the sport is all about and to build a sense of comfort within the group. Ramos said his new team includes fighters of all skill levels, including members with no previous boxing experience. “I want bring everybody up to the same level,” he said. The club will perform at this college April 19. “April 19 is our first date for the SAC Boxing Show,” Ramos said. Members of this college’s boxing team will compete against each other as part of a fight card determined by Ramos. Ramos also takes students to local boxing gyms for competitions, he said. Ramos said the next competition is at 7:15 p.m. April 6 at Texas State University. “They have two fraternity groups that go against each other, it’s called ‘Fight Night,’” he said. Ramos said the team was invited to the event and five students will be going. The five students competing are nursing sophomore Antonio Silva, liberal arts sophomore Rafael Ontiveros, kinesiology sophomore Michael Rico, biology and pre-nursing sophomore Carlos David Lopez and biochemistry sophomore Albert Gomez. Ramos said three main goals he sets for the boxing club members are to learn discipline, integrity and commitment. “A lot of people think boxing is about making somebody bleed and it is not about that,” he said. For more information about the boxing club contact the office of student life at 210-486-0125.